Is Australia becoming a less tolerant nation? There seems to be rising public concern over refugees, though boat people are but a tiny proportion of our overall immigration intake. Is the concern over refugees less about the numbers and more about the sorts of people that are arriving in this country? I would like to think not, but I suspect that it indeed may be. There is undeniably an element of racism in Australia, just like there is in every nation. It is part of human nature to fear those who do not look like us, or who wear different clothes, eat strange foods and don't worship in the same way we do. In Australia, there seems to be a fear that people from non-European backgrounds will come this land and change our country – in some indefinable way – for the worse. I utterly reject that. I believe most immigrants who have come to this country have changed it for the better. And I feel that we should support immigrants fleeing persecution in far-off lands, not persecuting them anew. Let's not forget that, apart from a small down-trodden minority, we are all relatively recent immigrants to this land. This country would be the worse were it not for our even more recent immigrants. 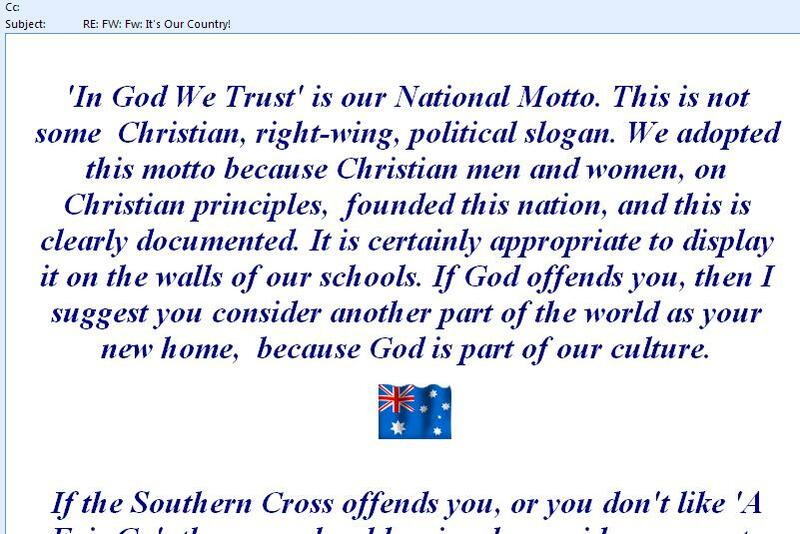 To increase my concern that xenophobia is on the rise, someone who should have known better – who I had thought of previously as holding fairly moderate views – just sent me the following email in which I only include the text (the little squares or question marks denote a flag or kangaroo motif). RE: FW: Fw: It's Our Country! After Sydney not wanting to offend other cultures by putting up Xmaslights. After hearing that the State of South Australia changed its opinion and let a Muslim woman have her picture on her driver’s license with her face covered. Quote: nor do I hold a grudge against anyone who is seeking a better life by coming to Australia. However, there are a few things that those who have recently come to our country, and apparently some born here, need to understand.This culture has been developed over two centuries of struggles, trials and victories by millions of men and women who have� sought freedom. “In God We Trust” is our National Motto. This is not some Christian, right wing, political slogan. We adopted this motto because Christian men and women, on Christian principles, founded this nation, and this is clearly documented. It is certainly appropriate to display it on the walls of our schools. If God offends you, then I suggest you consider another part of the world as your new home, Because God is part of our culture. If the Southern Cross offends you, or you don’t like “A Fair Go”, then you should seriously consider a move to another part of this planet. We are happy with our culture and have no desire to change, And we really don’t care how you did things where you came from. If you aren’t happy here then LEAVE We didn’t force you� to come here. You asked to be here. So accept the country YOU accepted. Pretty easy really, when you think about it. I figure if we all keep passing this to our friends (and enemies) it will also, sooner or later get back to the complainers, lets all try, please. No matter how many times you receive it…please forward it to all you know. Disturbing, isn't it. But did you spot the obvious error? "In God we Trust” is not Australia’s motto and never has been…it’s the United States of America’s. Australia doesn’t have a national motto. If it did, maybe it would be, “give everyone a fair go”. Please don’t send me this rubbish again.